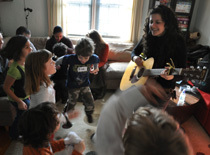 4th birthday parties in NY, NJ and Conn.
Four year olds are at the age where they have developed enough social skills to truly listen, sing, dance and participate as a collective whole. By 4 years of age, children have been socialized to interact with both children and adults in a more structured way. This age is magical, and what four year olds were beginning to do at age three, they now do with precision and accuracy. Four year olds really do “jump high” and can “hug themselves like teddy bears” and can do really “crazy dances”, all within both fun and safe boundaries. In addition, with just a few parents as helpers, you may consider doing a drop off party.